There's a new Flare handset in town - the Cherry Mobile Flare X Lite. It packs 3GB RAM, FHD display and more. Cherry Mobile Flare X Lite is now official. The smartphone comes with a promising specs-sheet which includes the 3GB of RAM and 5-inch full HD display. What's even more enticing is the fact that the smartphone only cost Php 4,999. The Flare sub-brand has been known to its game-changing specs since it was launched back in 2012. 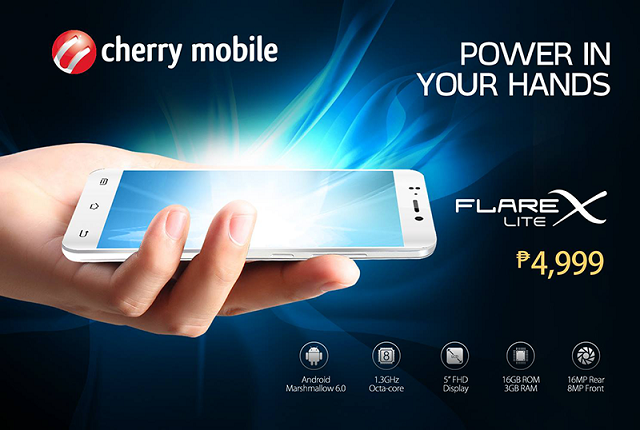 Now, the popular sub-brand lists another member of its big family - the Cherry Mobile Flare X Lite. Aside from the mentioned specs above, the smartphone is also equipped with 16-megapixel rear camera and an 8-megapixel selfie shooter. All of your media will be stored in the 16GB native storage and if you need more room, it can be expanded up to 64GB. On paper, I think the handset packs a very decent feature set except the fact that it carriers only 2000 mAh non removable battery. Knowing that it touts a full HD display and an octa-core processor, buyers of this smartphone could consider buying a powerbank as well.